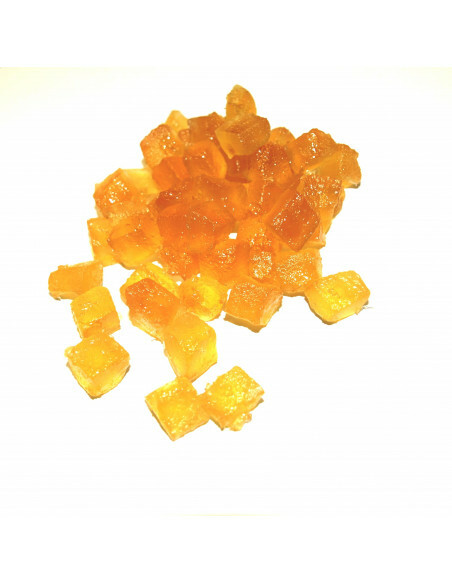 The cubes of candied yellow melons allow you to make delicious Provencal desserts. Traditionally used as fodder in the brioche of Provençal Kings for Epiphany and in fruit cakes, they are also perfect for muffins, ice creams and other pastries. Ingredients: melon, glucose-fructose syrup, sucrose, potassium sorbate, citric acid, sulfur dioxide (sulphites). Nutritional information (per 100g): Energy 290 Kcal / 1250 kJ; Fats <0.5g including saturated fatty acid <0.3g; carbohydrates: 72g including 60g sugars; 1g fibers; 1g protein; salt <0.1g.